Although bipolar disorder is a lifelong, recurrent illness, you are not powerless. 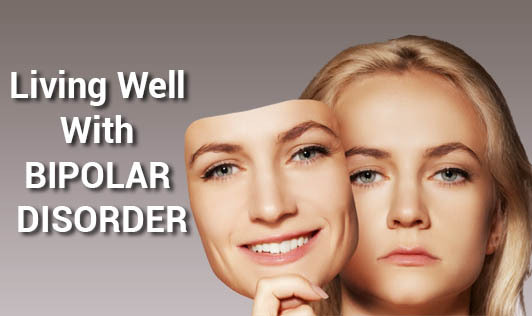 Living with this condition requires certain adjustments just like diabetics who take insulin; if you have bipolar disorder it's important you make healthy choices for yourself. Managing this condition starts with proper treatment, including medication and therapy. Additionally, there is so much more you can do to help yourself on a daily basis. • Learn more about your condition and techniques that can be used to improve daily life. This is the easiest thing a person can do to help themselves. • Follow a routine which includes a good diet, enough sleep, and exercise. Having a daily routine will keep your body active which in turn will help you feel better emotionally. The mind and body are interrelated; hence ignoring one will have an effect on the other. • Keep your work life at bay. • Manage stress and learn how to relax. Use relaxation techniques such as meditation, yoga and deep breathing as it can improve your mood. • Don't skip your medication. If you do, keep your loved one and doctor informed. • Know your triggers and monitor your symptoms and mood. • Know the side effects of your medication. • Avoid alcohol and illicit drugs as it can cause poor cognitive functioning and a lower chance for a full recovery of symptoms. Making these choices will keep your symptoms under control, reduce mood episodes and help you take control of your life.